Q: How much space should my chickens have inside their coop? A chicken coop is any structure in which your chickens shelter. 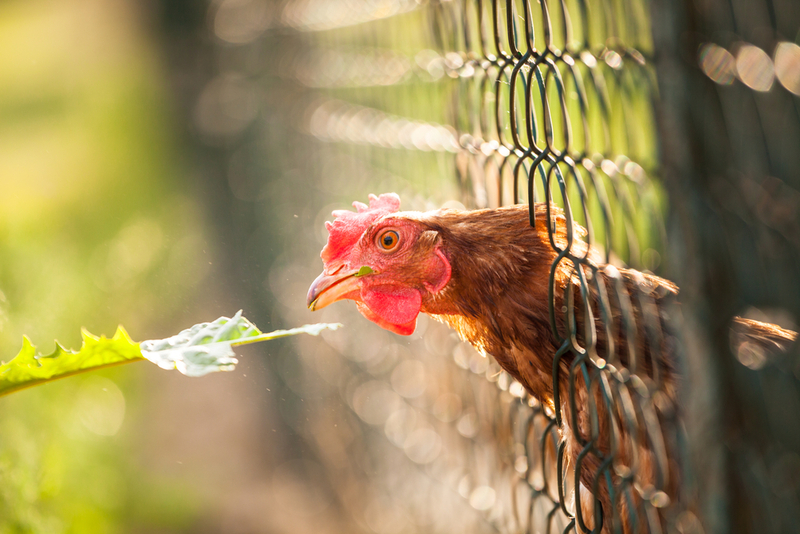 In most areas of the country, a chicken coop is an enclosed space, but in warmer areas many people use a three sided coop to make sure it doesn't get too hot inside (the last side of the coop is usually secured with something like welded wire hardware cloth). A coop can be made of plastic, wood, metal or fiberglass. It can be made of recycled pallets, or it can be a re-purposed playhouse. It can be built by hand or purchased. Chicken coops usually contain nests for laying and roosts for sleeping. Feeders and waterers are sometimes kept in the coop, but if your coop is very small, you may prefer to keep them in a sheltered area of the run. The "run" is a fenced or enclosed outdoor yard space you give your flock. As to how much space you should give your flock overall, the more the better, certainly! The more space your chickens have, the less stressed the flock will be. When your flock is concentrated into a very small area, they will have more of a tendency to pick on one another and squabble. This is especially true if they have nothing to forage and nothing with which to entertain themselves. Indoors, the most important thing is that there be adequate roosting and nesting space. If the outdoor space you provide your flock isn't protected from the elements (i.e., rain and snow can get in), and you live in a cold winter area, then you also need to provide your flock a good amount of floor space for times when the weather is bad enough that they stay inside. But if your outdoor run is covered, minimal indoor floor space is needed. As a rule of thumb, the minimum amount of space you should provide each chicken is 10 square feet, and as we mentioned before, the more space, the better! In fair weather, chickens really don't want to be inside for any length of time. The indoor space can be small so long as the run provides plenty of outdoor space, and vice versa. Chickens in mobile coops can often get along with less than 10 sq feet per bird because the coop and run are moved every day so they always have access to fresh pasture. That keeps them engaged and interested in foraging behaviors. They are ALWAYS interested in being able to access fresh greens, and if their outdoor space is too small, they will quickly forage their run to dust. That creates more work for you, because you'll have to make extra effort to provide good nutrition and keep them entertained so they're not too irritable with each other. You'd hate being locked up with nothing to do, either. 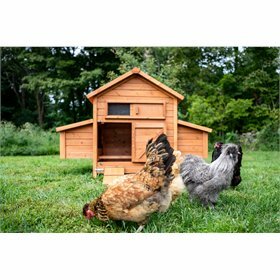 Before you purchase (or design/build) your coop and run, you'll want to read about the four ways to provide ranging options for your flock, and determine which one is right for you. 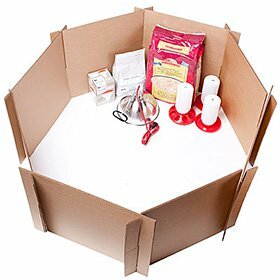 You may want different features for your coop based on how you decide to manage your small flock of pet chickens! Are there any special secrets to help my chickens stay warm in the winter? Do chickens like music in the coop? 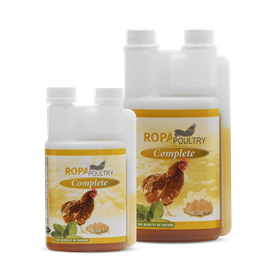 Do you have any tips to help me keep my coop sweet smelling in the heat of summer? 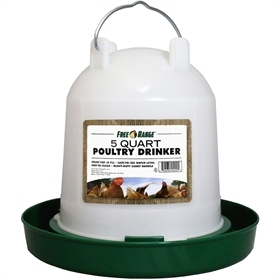 How can I help my chickens stay cool in the summer? How do I get my chickens to sleep on their roosts instead of in their nest boxes at night? How do I get my flock to go into their coop at night so I can shut the door and make sure they're safe? How do I keep my run from becoming muddy? How much space should my chickens have in their run? How can I make my coop well-ventilated, but not drafty? 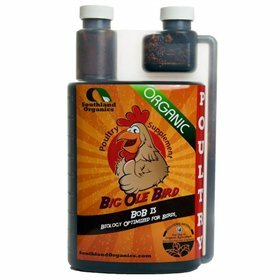 Should I heat my chicken coop in the winter? 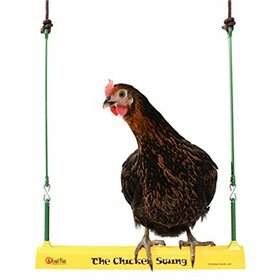 How do I transition my juvenile chicks to their outdoor coop when it's cold outside? My flock is pecking one another! What should I do? Should I free range my chickens? 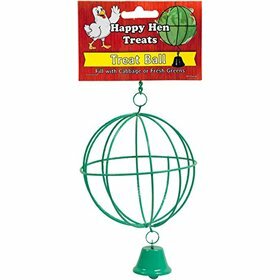 Should the chickens' feeders and waterers go inside the coop, or should they go outside in the run? What is the deep litter method of coop bedding management, and how does it work? 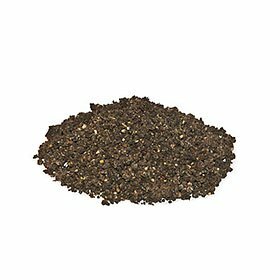 What type of bedding or litter should I use for my chickens?